Aung San Suu Kyi is a political activist and a leader of the movement for democracy in Burma (Myanmar). 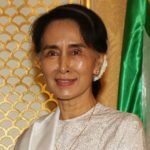 She spent almost three decades under house arrest because she was viewed as the biggest threat to military rule in Burma. During this period, she was one of the most famous political prisoners. She won the Nobel Peace Prize in 1991 as well as the Sakharov Prize for Freedom of Thought, Simon Bolivar Prize, the US Congressional Gold Medal, and the Presidential Medal of Freedom etc. She is planning to run for the presidency in the next election. "All military regimes use security as the reason why they should remain in power. It’s nothing original." "I think I should be active politically. Because I look upon myself as a politician. That’s not a dirty work you know. Some people think that there are something wrong with politicians. Of course, something wrong with some politicians." "At this age, I should be leading a quiet life." "Of course I regret not having been able to spend time with my family." "War is not the only arena where peace is done to death."